In this case, this guy takes the shirt off of his own back in order to keep his kid safely in the chair while he prepares a meal! That way, he knows his child is safe and sound. Genius! This guy refuses to carry around his child in the chairs and opts to use this hand truck to roll the child around with ease. Not a bad idea at all! After all, these tools were invented for a reason. . . These twins are doubled up and going on the ride of their lives! Of course, no mom would ever consider doing this. . . That’s what dads are for! So long as no child was hurt during the process. . . 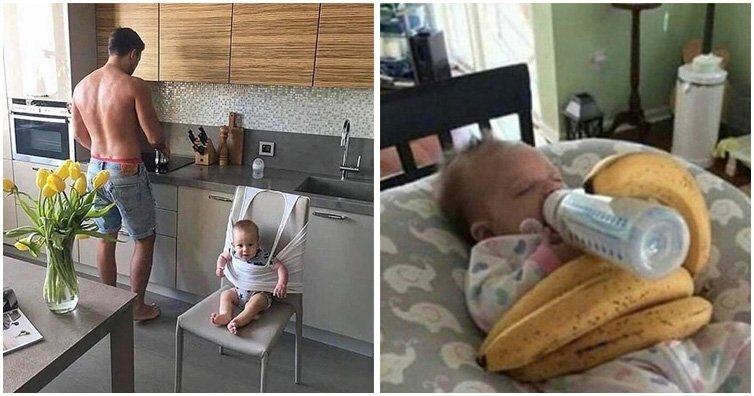 In this case, a few bananas were used to get through feeding time with this little bundle of joy and although the ideas appear to be a bit bananas, it clearly worked great! This child doesn’t seem to mind. I would expect to see this with some duct tape. . . No man is without that! However, I suppose any tape will do! In this case, a father decides to NOT buy another expensive gadget for his child and simply uses this recycling bin to help guide his child through his first steps in life. This appears to work just fine. In this photo, a dad is using his discarded weights to hold his child firmly against a soft cushion. This baby thinks he’s being cuddled to sleep and it seems to work great! This is a great idea! By using the lid of a coffee cup, this dad can catch the mess BEFORE it’s made! We’re used to putting our kids in any rolling basket but these look like the perfect size for small children. This kid appears to be having a great time! The last month we have really noticed Jack wanting to be constantly on the move. Pulling himself up on the coffee table and the couch which keeps us busy. It can also be quite a workout when you are shopping without the pram and have to carry 11kgs! I needed a break so I popped him in the basket and he absolutely loved it! Try it! This dad thinks that he has the solution to this scenario! This dad doesn’t have time to hold in the pacifier on his own so he enlists the help of his child’s cuddly friend. Literally! What a neat way to keep your child nearby and still out of harm’s way in this shop. Maybe the kid will learn a thing or two while he’s hanging out with dad! However, that just doesn’t matter to this dad who uses his own socks to keep his kid’s feet warm and toasty! When there’s no time to make a proper sandwich, this one will do! 16. When only mom will do. This guy had a clever trick to make baby think it is mom feeding him. Seems to be working a treat. 17. The make shift changing table. #DadHacks #DirtyBathroomFloor Men need changing tables too. Buncha sexist women out there keeping them for themselves. Me and #oliverjamesgaspard will always prevail though. 18. The perfect grocery list holder. When there is nowhere else to put your shopping list, why not use baby’s head? This daddy couldn’t work out how to plait his daughter’s hair, so he just made it into a piece of rope. This Dad was seriously impressed with what he saw this mom do in order to keep her kid in one place while waiting to be seen… note to self, find a doctors surgery that has one of these tables! This Dad knows how to live! Just because his kid loves the swing doesn’t mean it needs to interrupt his “me-time” right? 10/10 for creativity! Don’t have one of those fancy cars with the TV’s built into the back of the seats and about to head out on a long journey with your rambunctious little ones? Never fear! Just do what this Dad did and use some stretch cords to secure a tablet to the back of the seats yourself! Taking your kid out on their trike and they can’t quite get the hang of it? Well this Dad has the perfect solution; tie a piece of rope to your keys and use them to pull your little one along with you! Going on a vacation with the family and the kids are tiring out already? Just load them up onto your luggage and cart them around like a carry-on!